Global warming caused by the human-driven release of greenhouse gases has helped to destabilize the ice sheet, though other factors may also be involved, the scientists said. The rise of the sea is likely to continue to be relatively slow for the rest of the 21st century, the scientists added, but in the more distant future it may accelerate markedly, potentially throwing society into crisis. Two scientific papers released on Monday by the journals Science and Geophysical Research Letters came to similar conclusions by different means. Both groups of scientists found that West Antarctic glaciers had retreated far enough to set off an inherent instability in the ice sheet, one that experts have feared for decades. NASA called a telephone news conference Monday to highlight the urgency of the findings. 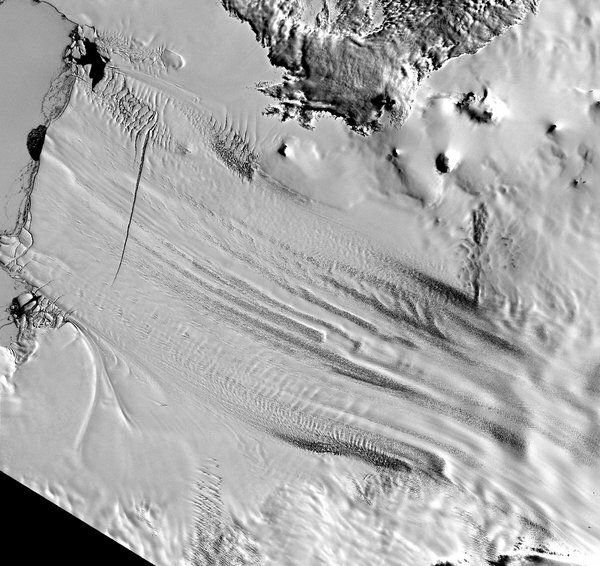 The West Antarctic ice sheet sits in a bowl-shaped depression in the earth, with the base of the ice below sea level. Warm ocean water is causing the ice sitting along the rim of the bowl to thin and retreat. As the front edge of the ice pulls away from the rim and enters deeper water, it can retreat much faster than before. In one of the new papers, a team led by Eric Rignot, a glaciologist at the University of California, Irvine, used satellite and air measurements to document an accelerating retreat over the past several decades of six glaciers draining into the Amundsen Sea region. And with updated mapping of the terrain beneath the ice sheet, the team was able to rule out the presence of any mountains or hills significant enough to slow the retreat. Those six glaciers alone could cause the ocean to rise four feet as they disappear, Dr. Rignot said, possibly within a couple of centuries. He added that their disappearance will most likely destabilize other sectors of the ice sheet, so the ultimate rise could be triple that. The two teams worked independently, preparing papers that were to be published within days of each other. After it was learned that their results were similar, the teams and their journals agreed to release the findings on the same day. Scientists said the ice sheet was not melting because of warmer air temperatures, but rather because relatively warm water that occurs naturally in the depths of the ocean was being pulled to the surface by an intensification, over the past several decades, of the powerful winds that encircle Antarctica. And while the cause of the stronger winds is somewhat unclear, many researchers consider human-induced global warming to be a significant factor. The winds help to isolate Antarctica and keep it cold at the surface, but as global warming proceeds, that means a sharper temperature difference between the Antarctic and the rest of the globe. That temperature difference provides further energy for the winds, which in turn stir up the ocean waters. Some scientists believe the ozone hole over Antarctica — caused not by global warming but by an entirely different environmental problem, the human-caused release of ozone-destroying gases — may also be adding energy to the winds. And natural variability may be contributing as well, though scientists do not believe it is the primary factor. The global sea level has been rising since the 19th century, but Antarctica so far has been only a small factor. The biggest factor to date is that seawater expands as it warms. But the melting from both Greenland and Antarctica is expected to be far more important in the future. A United Nations scientific committee, the Intergovernmental Panel on Climate Change, has warned that the global sea level could rise as much as three feet by the end of this century if stronger efforts are not made to control greenhouse gases. The new findings suggest the situation is likely to get far worse in subsequent centuries. The effects will depend in part on how much money future governments spend to protect shorelines from a rising sea. Research published in 2012 found that a rise of less than four feet would inundate land on which some 3.7 million Americans live today. Miami, New Orleans, New York and Boston are all highly vulnerable. Richard B. Alley, a climate scientist at Pennsylvania State University who was not involved in the new research but has studied the polar ice sheets for decades, said he found the new papers compelling. Though he had long feared the possibility of ice-sheet collapse, when he learned of the new findings, “it shook me a little bit,” Dr. Alley said. He added that while a large rise of the sea may now be inevitable from West Antarctica, continued release of greenhouse gases will almost certainly make the situation worse. The heat-trapping gases could destabilize other parts of Antarctica as well as the Greenland ice sheet, potentially causing enough sea-level rise that many of the world’s coastal cities would eventually have to be abandoned. An earlier version of this article misstated the surname of the lead author of a paper in Science about the accelerated flow of glaciers in West Antarctica. He is Ian Joughin, not Joaquin.